If you’re a commercial fiction novelist on a shoe-string-budget, this resource is for you. Should you invest money in a paid review? What works better to generate a review: a Press Release or a Query Letter? What's a Sell Sheet and why do you need one? How do you build an army of eager reviewers? What can an author do on e-retailer sites to get more positive customer engagement? What recourse do you have if a Hater targets your e-retailer site? To avoid a libel lawsuit, what is the acceptable way to quote a review? How can reviews be used in a book-marketing campaign? The guidebook was created for authors, who would rather write novels than market them. The helpful documentation in this guidebook includes real-world examples that have actually "worked" in the trenches, generating first rate, professional book reviews -- and sales from those reviews. In addition to 30 years of marketing and publicity expertise, Adrienne possesses 20 years of hands-on book-selling experience. Before launching her Indie writing career, she wrote 5 novels for Legacy Publishers (Bantam and Avon/Harper Collins.) 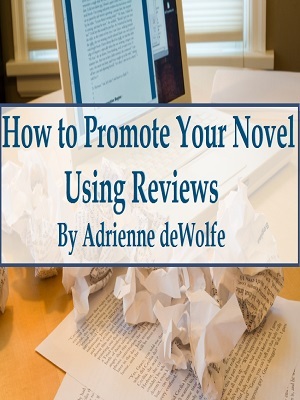 The tips she shares in How to Promote Your Novel Using Reviews come from her real-life, "in the trenches" experience as an author and publicist. Buy the 21-page downloadable PDF. Note: After your payment is approved, click the "Continue" button for your downloads.